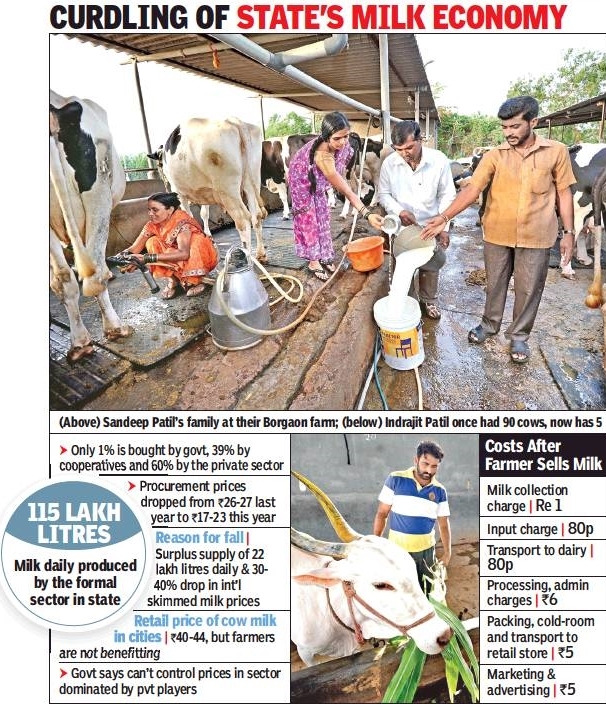 A year ago, dairy farmers in Maharashtra got up to Rs.27 per litre of cow’s milk, but prices plunged by Rs.4-10 eight months ago as a result of a surplus and a crash in international skimmed milk powder prices. Babasaheb Mane from Sangli’s Mahuli village was once a proud dairy farmer. He made Rs 30,000 a month from his four cows last year. Today, he and his wife work as farm labourers to keep their home running. Mane sells 40 litres of milk daily for Rs.17 per litre. “I make Rs.720 a day but spend Rs.1,000 on the cows. I used to make a profit of Rs.15,000 per month but now I make a loss of Rs.9,000,” he says. Farmers here are trapped between the fall in procurement rates and sharp increase in the costs of inputs, including fodder, oil-cakes and lactation pellets for cattle over the last year. Maharashtra’s formal sector collects 115 lakh litres of milk daily. In June 2017, after the historic farmer strike, the state hiked the procurement price from Rs.24 to Rs.27 per litre. However, prices plummeted in just a few months. Since November, the state has had a surplus of 22 lakh litres per day. At the same time, international skimmed milk powder prices fell 30-40%. Unable to sell their milk powder stock, dairies faced losses and cut the price offered to farmers. Maharashtra currently has stocks of 29,000 tonnes of skimmed milk powder. The bulk of the state’s dairy sector is private. Only 1% of the state’s milk is bought by the government and 39% by cooperative dairies mainly controlled by the Congress and NCP. As much as 60% is bought by private dairies. The state admits it cannot control prices in a decontrolled sector dominated by private players. “When the Milk Control Order was in force till mid-2000, the state controlled licences to dairies. But now milk is an open commodity,” said state dairy development commissioner Rajeev Jadhav. The government has tried to enforce the procurement price of Rs.27 by issuing directives to cooperative dairies. “But the cooperative dairies went to court and in most cases, the high court issued a stay,” said Jadhav. Cooperative dairies accuse the BJP government of trying to crush a sector controlled by the opposition. Dairies are demanding an export incentive for skimmed milk powder and subsidies to milk farmers, like that offered by Karnataka.CM Devendra Fadnavis has asked the Centre to declare a minimum support price for milk and 10% export incentive on skimmed milk powder. Those leading the milk agitation say dairies are also exploiting farmers to make a difficult situation worse. “If the entire dairy industry is impacted by skimmed milk powder stocks, how are other states offering higher procurement rates? And why are dairies in Kolhapur able to offer higher rates than other parts of the state?” asks Ajit Navale of the Kisan Sabha. By now, even the bigger dairy farmers are feeling the heat with many exiting the trade. Indrajit Patil had a farm with 90 cows in Shirdon village in 2007. Now he has only five. With cattle markets depressed, he can’t even sell them. “The beef ban and fall in milk prices has shattered the cattle markets. I bought each cow for Rs.50,000, now the price is Rs.30,000. I am just waiting for the right time to sell,” he says.